Fine porcelain from Russia is becoming exceedingly collectable and crops up nowadays at most antiques fairs. Although made by several factories including Lomonsov, Polonye, Kiev, Gzhel, Kanakova and Dulevo, it is the Lomonosov ornaments with which most collectors first become familiar. 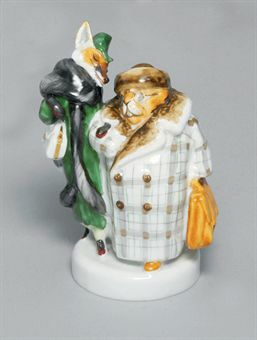 Pictured: A porcelain group of a fox and a beaver by the Lomonosov Porcelain Factory, Leningrad, circa 1960s A humoristically depicted couple of a fox and beaver after a fable by Sergei Mikhalkov, marked under base with blue overglaze factory Cyrillic monogram ‘LFZ’, incised ‘4’ and painted in grey ’21’ 4 7/8 in. (12.5 cm.) high. Sold for £1,000 at Christies, London, October 209. Image Copyright Christies. The Lomonsov Porcelain Factory in St Petersburg was founded in 1744, initially to supply the Russian Royal Family with fine porcelain. During the reign of Catherine the Great it was called The Imperial Porcelain Factory, while after the Revolution it became the State Porcelain Works. Later still it was renamed Lomonosov in honour of the founder of the Russian Academy of Science. 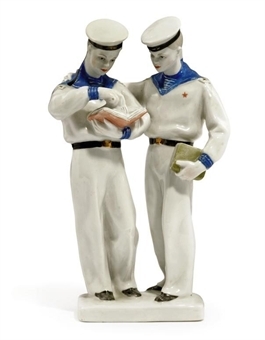 Pictured: Two Porcelain Figures Lomonosov Factory, Ussr Period The First Modelled As A Soldier, Seated Playing The Accordion, The Second As Two Naval Soldiers Glancing Through A Book 5¼ In. (13.3 Cm.) And 7¾ In. (19.7 Cm.) High (2). Sold for £313 at Christies, London, Nov 2008. Image Copyright Christies. the Lomonosov bears look friendly, but others are fierce, with sharp teeth. The typical sculptures from this factory are easily recognised by their smooth, rounded appearance, which often takes on a modernistic form. They are hand-painted, normally in naturalistic colours of brown, tan, beige, black and grey, and their siz es range from tiny figures just an inch high, to large, dramatic sculptures. Some of the pieces feature ‘Yakuts’, children who resemble eskimos in white and grey outfits, while other ornaments are based on Russian folk or fairy tales. Many additional items are available too, especially dinner services, the most famous pattern being ‘Cobalt Net’, a dramatic diamond-shaped design in deep blue and gold.The Lomonosov Porcelain company is still active, but many collectors prefer the earlier pieces, even though the new models are often identical. It is the backstamp which is different. Twenty years ago, Russia underwent a great deal of internal strife, and the export of ceramics stopped. When the goods began to arrive in Britain once more, the backstamp had changed – where once the mark had read ‘Made in USSR’ it now read ‘Made in Russia’. It is the USSR mark which most collectors seek, and at the moment the more common pieces are still plentiful, though always get a receipt, as some unscrupulous dealers are forging the mark. Note: This site is not affiliated with Lomonsov. It is designed to provide information to collectors of Lomonsov Porcelain.